Something about a baked pasta dish really warms my heart. Perhaps it’s the ease of the dish or the fact that it’s usually a classic comfort dish. Regardless, baked pasta dishes hold a very special place in my heart. It’s a must for the holidays and it’s usually an insanely affordable way to feed a lot of people. 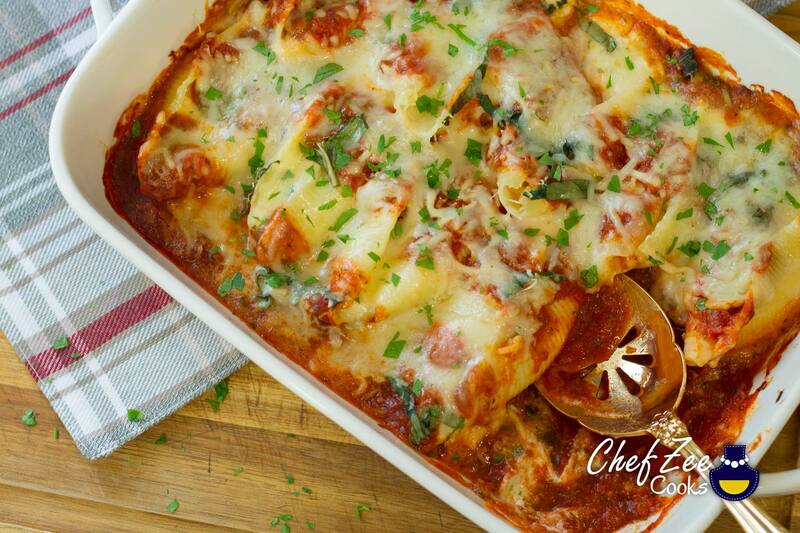 In particular, Cheesy Stuffed Shells are my favorite! The ricotta cheese mixed with fresh herbs and cheese is to die for! 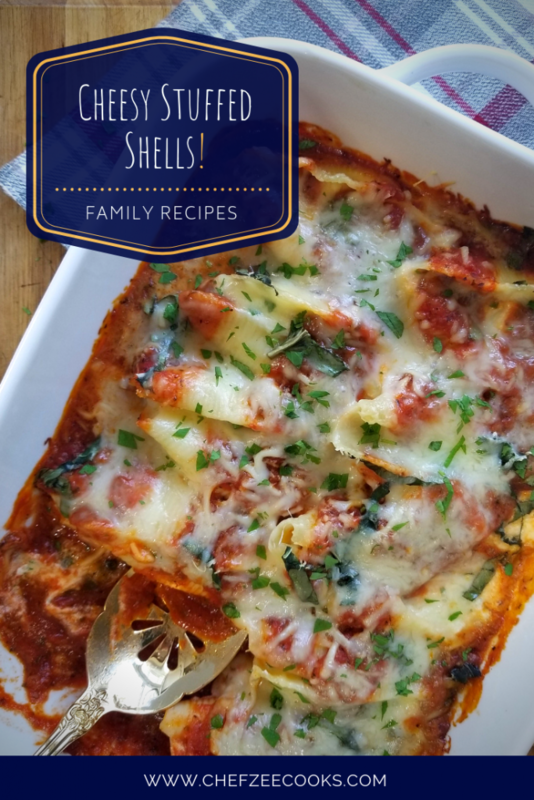 This classic Italian dish is a no brainer and I personally love that you can get the kids involved– that’s of course if you trust them! Things can get messy fairly quickly, but honestly that’s part of the fun. Over the years, I’ve developed some tricks to minimize the mess. If anything, I’ve even mastered how to make this dish in under 30 minutes. Now imagine putting together an impromptu dinner party in under an hour? … Life goals! Now despite Stuffed Shells being super easy to make, there are a few areas that you can completely mess this up. The key is to pay attention to the little things which will elevate this dish to the next level. When making the Stuffed Shells filling, finely dice the fresh parsley and basil. This makes for a much more pleasant eating experience. Freshly shred your own cheese! As a rule of thumb, always do this. I find that the cheese melts much more easily and tastes better. Whenever you shred your own cheese, the cheese itself is so much more moist than the the pre-shredded cheese. Home shredded Parmesan cheese definitely melts better than store-bought shredded cheese. If possible, try to use homemade Marinara Sauce. I have a yummy recipe here on my blog and YouTube channel. However, if you’re in rush like me sometimes, make sure to use a store bought jar sauce that you love that isn’t filled with a ton of preservatives and sugar. A personal favorite of mine is Rao’s Homemade Sauce. There are other great brands in the store. Just takes some time to read through the labels. Now my biggest tip of all is filling the Stuffed Shells. Since we’re using Jumbo pasta shells, filling them is fairly easy. All you need is a spoon. However, it’s here where things can also get a little messy. If you’re OCD like me, feel free to fill a piping bag with the filling and fill away! It’s super easy and you can even DIY the piping bag by using a ziplock bag instead. Using a spoon or a piping bag both take up the same amount of time, but you save on the cleaning end. Are you hungry yet? Let’s jump right into the recipe! Don’t forget to visit my YouTube Channel: Chef Zee Cooks if you’d like to follow along as I make, Cheesy Stuffed Shells! In a large mixing bowl, add ricotta cheese, 2 eggs, cup freshly shredded mozzarella cheese, 3/4 cup freshly shredded parmesan cheese, 2 tsp finely diced basil, and diced parsley. Add a pinch of salt and black pepper to taste. Mix everything until well combined. Using a 9×13 baking dish, coat the bottom of the pan with marinara sauce. Using a spoon or piping bag, carefully fill cooked pasta shells with ricotta cheese filling and gently place into baking dish. Repeat until all of the shells have been filled. Afterwards, gently pour marinara sauce over stuffed stuffed shells. Be sure to pour sauce in the corners of the baking dish. How much sauce you’d like to add is entirely up to you. Some like their Stuffed Shells saucy and others like to add extra sauce while eating it. After adding the sauce, sprinkle leftover basil over top. Then add the remaining shredded parmesan and mozzarella cheese. Cover with aluminum foil. You can make this dish ahead of time before baking. Simply build pasta shells in baking dish and store covered in fridge or freezer. Once you're ready to bake dish, first let pasta come up to room temperature. If frozen, you may need to defrost dish in fridge a day or two before.